All orthodontic treatment works in (essentially) the same way: by applying pressure on the teeth to move them into their ideal positions. While traditional braces rely on metal brackets and wires to move the teeth, Invisalign uses clear, plastic trays called aligners. In most cases, you’ll wear each pair of aligners for about two weeks before switching to a new set. 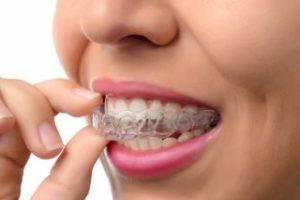 Some discomfort is normal during the first day or two of wearing a new set of trays, but it’s quite mild and manageable. With each new set of aligners, you’ll be able to see small changes in your smile that add up over time! The most obvious benefit of Invisalign in Wethersfield is that it’s clear, but there are many additional advantages! Comfort – The smooth, plastic aligners are much more comfortable than metal brackets and wires. Hygiene – Unfortunately, it’s not uncommon to have cavities or gum issues when traditional braces come off because it’s so difficult to keep everything clean. With Invisalign, you simply remove your trays before your daily hygiene routine, which makes it much easier to make sure your smile stays healthy. Less Treatment Time – On average, people spend about 24 months in braces, but only 12 months in Invisalign. Cost – Whether you choose Invisalign or braces, the cost will vary from person to person, but there usually isn’t much difference between the two options. Diet – With braces, you have to avoid hard, sticky or crunchy foods. With Invisalign, you can eat any food you’d like because you’ll be removing your trays prior to meals. Having the straight, even smile you’ve always wanted can change your life. And the best part is that you don’t have to wear traditional braces to achieve it! Dr. Thomas Dolan is an Invisalign-certified dentist who has been practicing for over 30 years. He’s seen dental technology come a long way in that time and is thrilled that he has modern options for patients who want to straighten their smile without braces. If you’re considering Invisalign and have any other questions, he can be reached via his website or at (860) 529-2000.